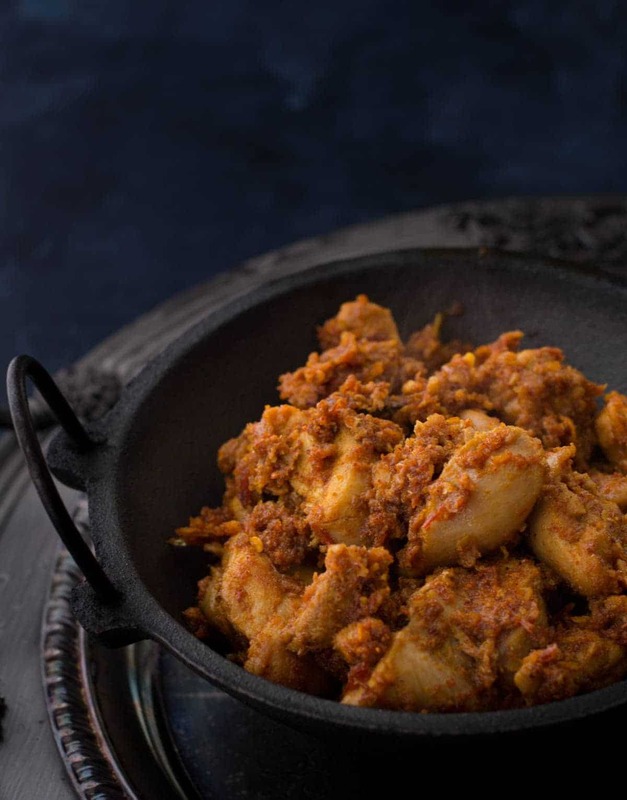 Kori ajadina is a dry, intensely aromatic dish that relies on grated coconut and Kundapur Masala powder to bring out the authentic flavors of Mangalorean cuisine. Also, commonly called as Chicken sukka, kori ajadina literally means dry chicken dish. If you’re a fan of the movie Ratatouille, like I am, you’ll know exactly what I’m talking about. There’s a particular scene in the movie Ratatouille where Anton Ego, the food critic, eats Ratatouille in the restaurant. After the first bite, he’s instantly transported back to his childhood, to the moment where he comes home to his mother cooking his favorite food. It’s beautifully shot, and the memories that the Ratatouille brings flooding back for Anton are similar to the ones I have whenever I eat Mangalorean food. Every time I eat this dish, my mind just goes back to the times my mom used to make kori ajadina when we had guests over. As the chicken cooked, it would fill up the house with the most joyous aromas. It was a test of patience to wait for the chicken to get done. I remember I would pop into the kitchen every few minutes and ask “Is it done?”. I am sure I drove my mom crazy but she would always say “I will call you the minute it is done”. And she would. How to make kori ajadina or chicken sukka Kundapur style? Kori ajadina is a popular dish among the Bunt community and is usually one of many dishes served at special occasions, like weddings and baby showers. As with any meat, this dish tastes far nicer when free-range chickens (desi murg) are used. Desi murg are specific breeds of free-range chicken native to India. If you’re cooking this dish in any other country, regular free-range chickens will be fine. It is usually made spicy and there can be a lot of variations from one household to the other on how this is prepared (check out the variation mentioned below the recipe). 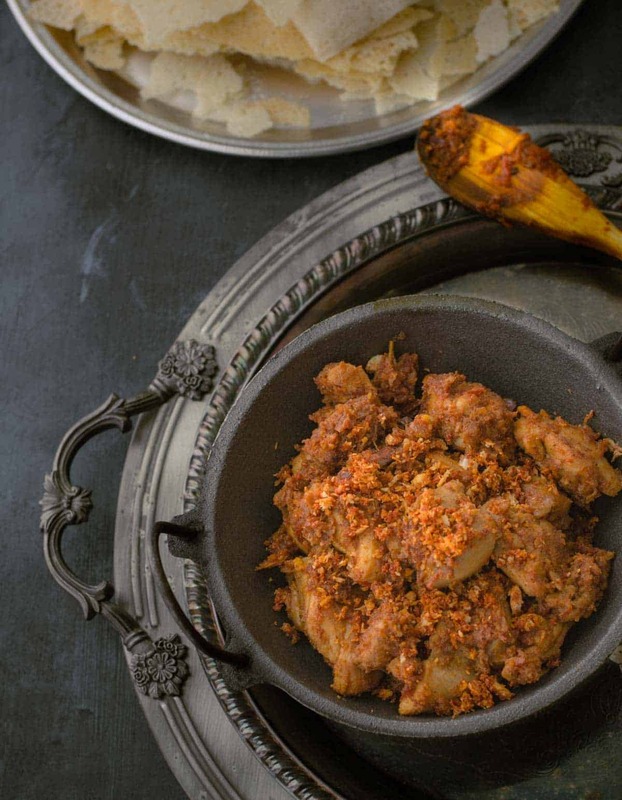 This version of the recipe calls for premade Kundapur masala powder but if you don’t have any at home, don’t despair – just follow the notes in this recipe below to make this spice mix at home. This is a short cut version my in-laws follow and in no ways tastes any different from the original version where the spice mix is made fresh before the dish is cooked. For a real feast, pair kori ajadina with kori gassi (Mangalorean chicken curry) and rutti (crisp, paper-thin wafers from rice) for a delectable mix of gravy and dry chicken, prepared in this traditional Indian cooking style. Heat oil in a medium sized wok over medium heat and add onions and garlic paste and fry them till they are translucent. Add tomatoes and fry them till they are soft and mushy. Add the chicken along with chili powder, salt and Kundpur masala powder (1 tablespoon) and mix well. Then add half a cup of water and let the chicken cook in it. Add water as needed (approximately 1 cup of water) till the chicken is done and the gravy thickens and is not runny. 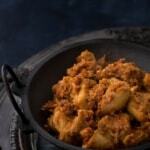 Add grated coconut mixed with Kundapur masala powder to the chicken mixture and mix well. Simmer it for 5 minutes and take it off heat and serve hot with steamed rice and curry. Variation 1: Follow step 1 mentioned above. Instead of cooking the chicken in the onion – tomato gravy with 1/2 cup of water, cooked chicken from Kori Gassi (Mangalorean chicken curry) is removed and added to the onion-tomato gravy. The chicken is mixed well and allowed to simmer for a couple of minutes before adding the grated coconut and Kundapur Masala powder. The Kori Gassi is then used to eat Rutti whereas Kori Ajadina is served as a side dish. Note - This may yield approximately 3-4 tablespoons of Kundapur masala powder. Make sure you use only 3 tablespoons for this recipe and save the rest for later. Heat a teaspoon of coconut oil in a medium-sized pan and over medium heat. Add chilies to it and roast them till an aroma emanates from it. Remove the chilies and keep it aside. Roast remaining ingredients (coriander seeds, cumin seeds, pepper seeds, and fenugreek seeds) for a minute or till it turns aromatic. Set it aside to cool it down (for approximately 10 minutes). Transfer them to a blender along with the chilies and grind them to a fine powder. Store it in an airtight container for future use. Hi! I tried this today…and my daughter loved it…thank you.. Thanks for stopping by and letting me know, Supriya :). Very delicious! Thanks for sharing this recipe. Keep up the good work ??? ?